So, it's October, which means Fall, right? Contrary to the typical conjured images of brilliant garnet, amber and gold leaves, where the crisp air commands sweaters and bonfires, such is not the case here in Pennsylvania. It is 80 degrees and green! Personally, I do not mind holding onto the tropical weather a bit longer, but at the same time, it is hard to think about Halloween when it feels like summer! Do you like Halloween? I don't know whether it is the inner child in me or the fact we have children, and their excitement over the years has excited us, but I have always been a sucker for party themes, themed food, theme decorations, etc., and Halloween is no exception. These stuffed mummy peppers are so stinking cute, and the epitome of Halloween, spooky and fun (even if it is 80 degrees where you live)! They are quick and tasty, a fabulous use for leftover peppers, and are a delightful Halloween appetizer or snack. The filling possibilities are endless, but our favorite is our Vegetable Cream Cheese Spread, chock full of fresh vegetables and herbs. You could also use chili or our Tomato Basil Cups filling to stuff the peppers. And, talk about quality time in the kitchen! This is an ideal project to spend time with the kiddos, no matter the age. Our children are teenagers now, but they still enjoy helping in the kitchen, especially when food is fun! Priceless! 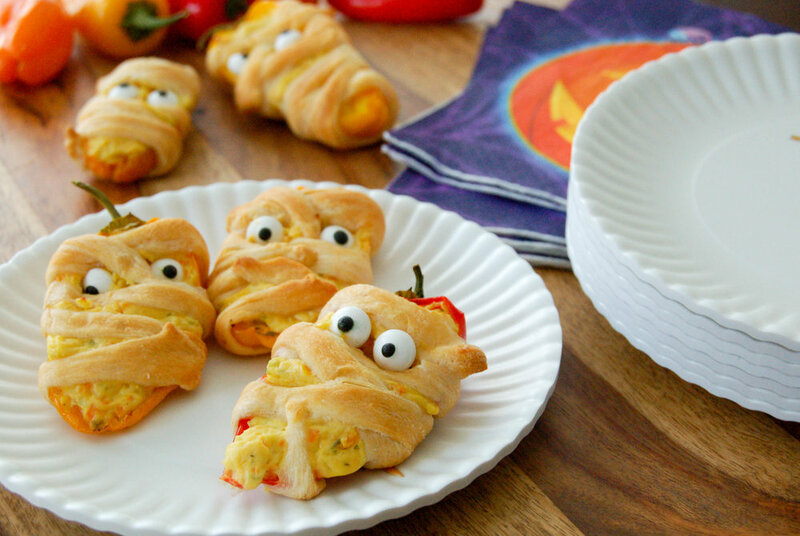 Serve these mummies with our Festive Deviled Eyeballs, Witches Cheese Brooms, Spooky Jack-o-Lanterns, and our Spooky English Muffin Pizzas for a frightfully eerie Halloween feast! Thank you for stopping by! Happy early Halloween! 1 can refrigerated crescent roll dough, cut into thin strips (we used Pillsbury's newest product, crescent sheets. You could easily use crescent rolls and pinch the seams together before cutting). Preheat oven to 350 degrees. Wash and cut peppers in half. Remove seeds. Line a baking sheet with parchment paper and lay out pepper halves. Fill each pepper with cheese mixture (see above). Set aside. On a lightly floured surface, with a sharp knife, cut the crescent rolls into thin strips (about 1/2 inch). Carefully wrap the peppers, criss crossing the dough to resemble a mummy. Bake at 350 degrees for about 10 minutes, or until dough is golden brown. Remove from oven and allow to cool for five minutes. 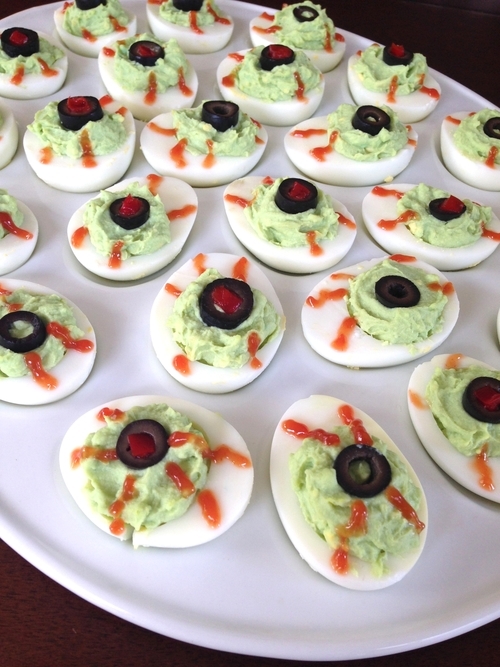 Add googly candy eyes for that last minute spookiness. (Important- do not be tempted to put the eyes on before baking, as they will disappear, literally, they will melt! Not that I've done that...ahem;) Serve and enjoy! * Note: These pepper mummies could easily be made ahead and frozen before baking. Serve these year-round. 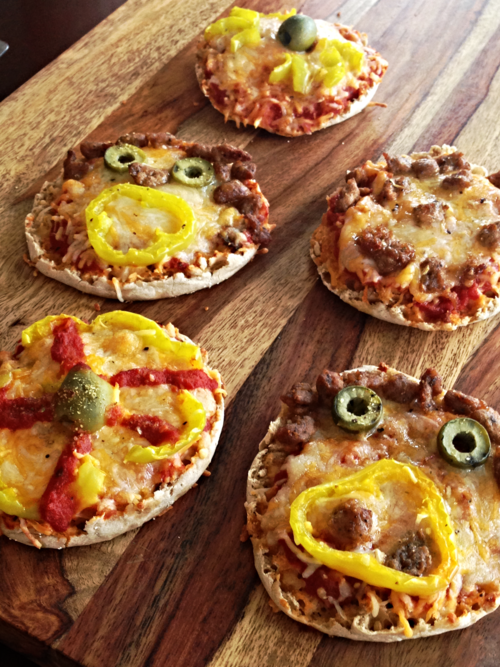 Simply remove the eyes and you have a delicious appetizer or snack in minutes!